Here are 7 simple reasons why we think UK brides will love David’s Bridal. We’ve hundreds of gowns for you to choose from in sizes 4-30 that you can even take home that same day, including exclusive designer collections like White by Vera Wang. You’ll also find a fantastic selection of colour coordinated styles for you and your bridal party. Our designers are obsessed with creating on-trend, couture-quality gowns with a fabulous flattering fit and feel. Exquisite handcrafted detailing adds breathtaking luxury and glamour. 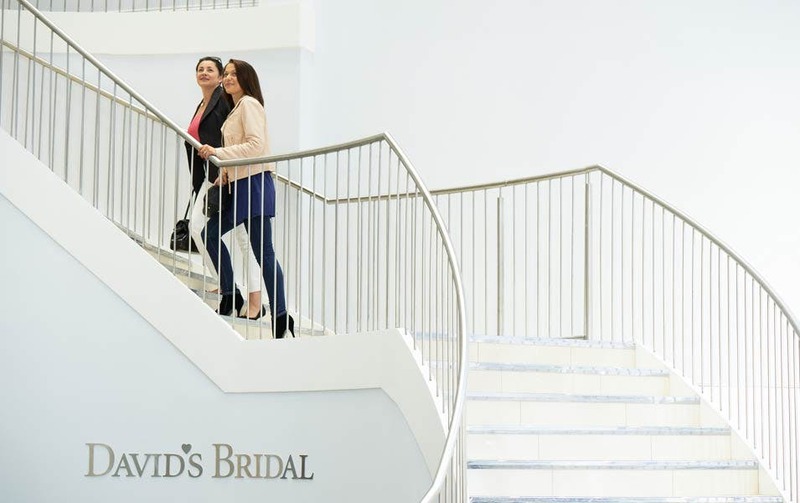 At David’s Bridal, you’ll find shopping for your wedding is a breeze with everything from lingerie and shapewear to onsite alterations for the ultimate fit and feel – all under one roof. Our caring and knowledgeable wedding consultants are passionate about making you look and feel fabulous and they are expertly trained to offer you the individual advice and attention you need. It’s so easy to create the perfect head-to-toe look for you and all your bridal party with everything in store including shoes, jewellery, veils, headpieces and much more. We believe you should look and feel a million dollars on your big day, whatever your budget. As the world’s largest bridal retailer, we have more buying power than anyone else and pass those cost savings on to you.